Instead, we had a great time walking in the woods, cooking, and exploring farm country. Everywhere we looked there were gorgeous old barns and cute little farm stands complete with hand-lettered signs. 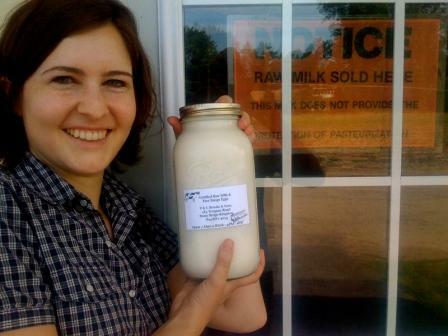 When we heard that there was a dairy farm nearby that sold raw milk I was surprised- I was under the impression that raw milk, along with fresh raw milk cheese, was tragically illegal in the US. As it turns out though, (according to this New York Times article) raw milk is legal in New York and 25 other states, but the milk can only be sold on-site at a small number of state-approved dairies. 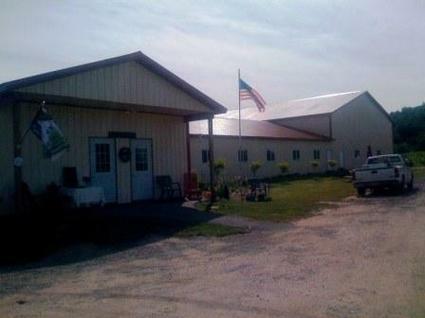 We were told by our “connection” to show up at F & C Brooks & Sons dairy at 4:00pm when the milking happened, so like the neurotic city folk we are we pulled up at 3:55 on the dot. Here’s what the farm looks like (backlit on an iphone, that is). A couple of barking dogs alerted the owner, Cindy, to our presence, and she ambled over to say hello. We breathlessly asked: “Are you going to milk the cows now?” Cindy smiled and instructed her co-worker, who was drinking a Budweiser, to hook one of the cows up to the milking machine. Cindy suggested we get a half gallon. You can bring your own jar, but we’d forgotten, so Cindy kindly provided one. As our milk was pumped, we were invited to wander around. 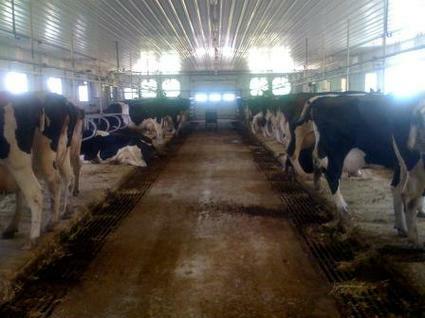 These cows were all Holsteins, which produce high-protein milk (unlike Jersey cows, which produce high butterfat milk). The cows are on supplements to increase the butterfat content in their milk. 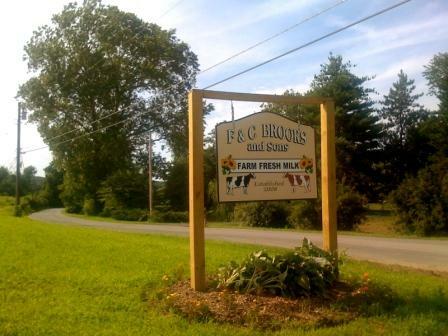 Though F & C Brooks has been shipping their milk to a DairyLea plant to be pasteurized and sold in supermarkets for over a year, they’ve only been certified to sell raw milk for the past eight weeks. 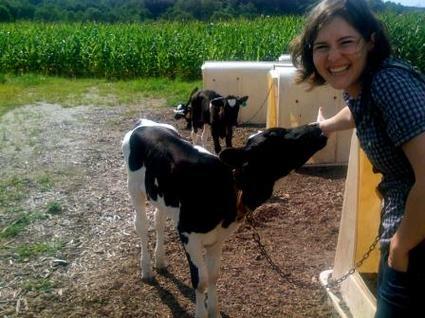 Getting certified was difficult and involved a lot of oversight: when Cindy was just shipping her milk to DairyLea her farm was inspected once that year, but since she’s started selling raw milk the farm has been inspected eight times in the past eight weeks! We went outside to check out the chicken coop. 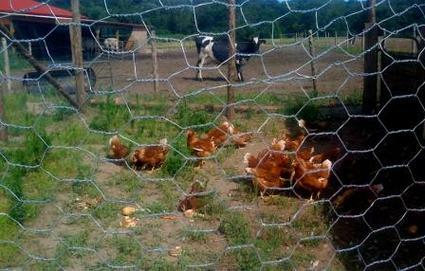 According to Cindy, F & C Brooks will start selling free range eggs “any day now”, as soon as the hens start laying. Not sure that you can tell from the picture, but the hens are eating bagels for lunch! Then we said hi to the baby cows- they’re kept outside because they’re only a couple months old and are still drinking milk. They were pretty enthusiastic about licking my hand- maybe it looked like an udder? We could have stayed all afternoon, but Cindy had work to do, so we picked up our half gallon jar, left four dollars on the counter and went on our way. We couldn’t wait to taste the raw milk so we stood outside and gulped it straight from the jar, with the sound of contented mooing in the background. well, like milk, really. It had a very clean flavor, definitely much fresher tasting than your standard mass-produced supermarket gallon. 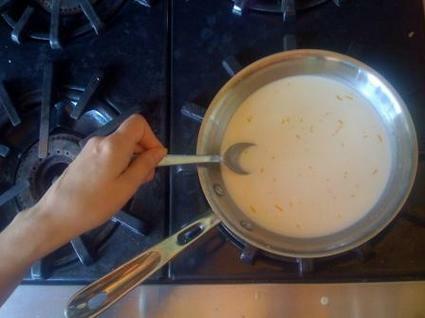 I’ve read in Harold McGee’s “On Food and Cooking” that the pasteurization process kills some of the complex, grassy aromas and flavors in raw milk and imparts a more vanilla-y, eggy flavor. 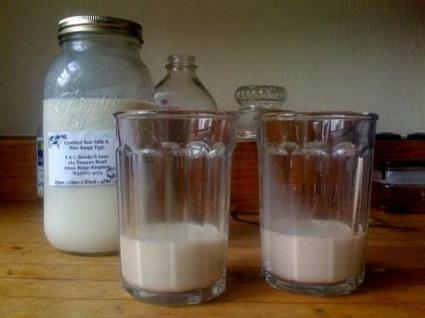 The milk tasted pretty comparable to organic pasteurized milk to us though. As Cindy suggested, when we got home we put the milk in the fridge and let the cream rise (processed milk doesn’t separate because it’s been homogenized, which keeps the milkfat evenly dispersed). We tried spoonfuls of the cream and liked it even better. I wanted to cook something with the milk, so I decided to make an improvised panna cotta. I skimmed off about a cup and a quarter of cream and scalded it, adding maple syrup, vanilla and about a teaspoon of orange peel. I took it off the heat- now it was time to add the gelatin. But how much? We didn’t have internet to google recipes on, so I based the gelatin-cream ratio off a recipe for jello jigglers on the back of the Knox gelatin package, which called for one packet per cup of liquid. Great idea, right? I divided the hot cream mixture between two cups and let them cool in the fridge, then dipped the bottom of the cups in hot water and unmolded them. Finally, I made a quick orange-rosemary-caramel glaze. I liked how the panna cottas looked: the orange peel had settled at the bottom so they had cute speckled orange tops; also, the cream had separated again as it gelled, so the panna cottas were two-toned. 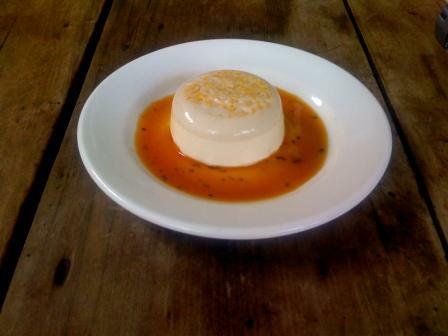 The flavors of the orange and maple worked nicely together and the glaze tasted good, but I’d shot myself in the foot by using too much gelatin- I had basically made raw milk jello jigglers. Bill Cosby might have liked them, but I was not a fan. Nonetheless, we still enjoyed our raw milk experience and will definitely go back to F & C Brooks the next time we’re upstate. Not just for the milk- don’t get me wrong, it was good, though Mark and I won’t soon be turning into raw milk junkies, roaming the streets for our next fix with telltale milk mustaches. What makes this place really worth the trip is getting to pet the cows, chat with Cindy, and watch the milk you’re about to drink pumped before your eyes. It’s a pretty cool experience and, for the price of a half gallon of milk, a real bargain.